Some games do grab your imagination and, through word of mouth alone, make you want to play them. Bioshock is one of them. It’s not a coincidence we have two copies of it (combined with Oblivion in an awesome double pack), which we both owned already before starting this project. It’s a shooter that does a lot with its story and philosophy, one of those games that has an impact and is often said to be one of the best. It even got a mention on 30 Rock which is cool in itself. We’ve been looking forward to this. And thanks to the above logistics, we’ll be able to play simultaneously. Yay! One of the main problems of stories these days is how you tell your story. A few paragraphs in a manual won’t do anymore – in fact, you’re not sure whether you’ll even have one. An intro movie might help, but that just starts the story – there’s not much influence afterwards, and who remembers it an hour later? Maybe you don’t have much of a story, you can say it instead. Minecraft is the biggest contemporary example, or for something we covered, Neptune’s Pride doesn’t need much more. Maybe you’ll use cut scenes for your exposition dumps. Long, long cut scenes. Final Fantasy is guilty of this, Metal Gear Solid is worse. You can have plenty of (possibly lengthy) conversations. Mass Effect or, older, Planescape Torment follow this route. The fact is that if done well there is nothing wrong with an exposition dump. Final Fantasy X and XII found ways to do it since you cared for the characters and their fates. The same is true for Mass Effect where the system used allowed you to actually skip unwanted exposition in many cases. 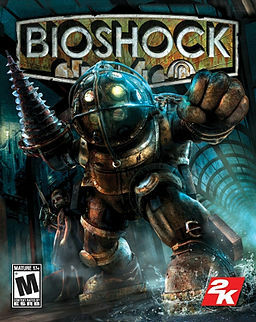 Bioshock, instead, integrates its storytelling and world building with gameplay. Although the game starts with a cutscene, after that there are few sections where you don’t have control and walk around while story is being told. One of the earliest bits that showed this was a sequence going on down the stairs from a hallway you walk along. As you do, you can hear an argument downstairs, a man telling a woman to open a door. You hear the argument going on and can check it out – see the people involved (although they attack you soon after). Plenty of small scenes keep going on around you as you travel, most not necessarily relevant, but all making the world feel more alive. Other parts of it include their own puzzles. There are plenty of log entries around the game area describing the facility, the world, the philosophy, the daily lives of people living there, tying into the characters you meet and the areas you walk through. It rewards exploration in a major way and adds a dimension to gameplay that makes it feel like you’re doing so much more. While this is probably the most immersive FPS I’ve ever played (although, as this is not my genre, that might not be saying much (personally I would put Fallout 3 as the most immersive… whilst not technically an FPS it was in many of the ways I chose to play it) ), it would be a waste to judge it solely based on that. As a shooter, it’s brilliant too. The game flirts with survival horror style resource limitations, similar to what we saw in Dead Space, but on the whole the game is more forgiving in its resource management and offers far more ways of helping you get through tough situations. And if even that doesn’t work, a simple (but justified in-game) respawn system allows you to come back easily without much backtracking. The RPG elements (where they are present) mostly feel limiting. You get special powers, needed to proceed or get to secrets, but can only have a limited amount of them. Switching seems to be quite a bit of bother. There are other upgrades, but there’s not even switching there – when I bought an upgrade I seem to have lost another one, discouraging experimentation and customization (for me at least). Later on you do get the opportunity to buy more slots but at the beginning it is really annoying… especially with a Big Daddy fight around the corner. One place where this actually seems to work better is with the Little Sisters. In short, you can save them or absorb them. Saving them gives you less immediate rewards, but has later rewards (plus the feel good feeling of saving a life in a world of crazy people all out to kill you and each other). It can be strangely sweet, adding a type of protection not many others give. Well, it is bittersweet since the only reason you even bother the Little Sisters is to harvest ADAM from them. Yes it means you get stronger and access to powers. Are you any better then the other occupants of Rapture for doing so? For me the most interesting thing about the game itself is the philosophy that underpins the city of Rapture. Those unfamiliar with or supportive of the philosophies extolled by Ayn Rand may be left cold by a lot of the game’s settings. However, as someone who has always been bemused by Rand this game ticked many boxes. In brief, Ayn Rand’s belief system can be summarized as follows “it is your right to pursue your own happiness at all costs”, not exactly noble but it does come with the caveat that if you are in the way of someone else’s goal you do not have the right to be pissed when they screw you over (something Rand was happy to live by until she lost the person she loved). Anyway, this is a gaming blog and in terms of gameplay this is a game that rewards those who happily tumble down the rabbit hole whilst shooting fire and ice from their hands. While there are some elements that don’t work as well, as an FPS this game is brilliant. It’s compelling, placing you in the middle of a world that feels alive, with people who have their own stories and their own lives. Even if there are some bits that feel off, the design and purpose seem so good that, as said, this is probably the best FPS I have ever played. It’s amazing how far the genre has come.